Clutter hotspot #3: Kids and the stuff they leave out. Your kids aren’t the only ones who leave stuff out, thereby creating surface clutter. Instead, you’re in good company! While misery loves company, solutions are even better! So here are two ideas to put into practice. 1. Establish a clutter bin. This is an idea I introduced in my Quick + Simple Clutter Control online class, and in my home, it’s an idea that has stood the test of time. 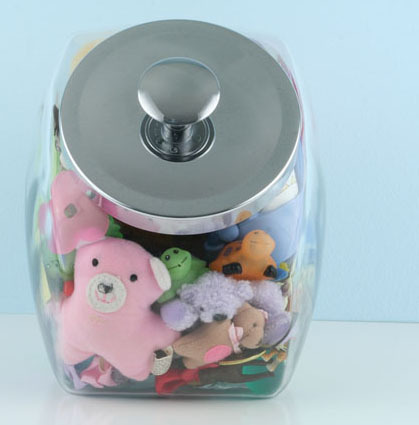 A clutter bin is simply a spot to temporarily stash your kid’s clutter. There are two keys to making this system work. First, your child is responsible for putting away the items in his or her clutter bin. This way, you’re teaching your child to be responsible for his or her belongings, without constantly having to nag. Second, the clutter bin needs to be located in a centralized location, close to where clutter builds up. In my house, before the clutter bin, kid clutter had a way of collecting on my kitchen counter. So our clutter bins are located in the laundry room, just a few steps away from the kitchen counter. 2. Make tidying up part of your daily routine. Set a timer for fifteen minutes, and challenge your kids to pick up the toys, books, and other items they took out and used today, and put them back where they belong. The ideal time to do this is at the end of the day, such as right before starting your kids’ bedtime routine. Clutter hotspot #4: Kids and the stuff people give them. Oh I remember those days. The days when every time one of my kids left the house, he or she would return with a bunch of stuff…treat bags, candy, papers, balloons, tiny little toys, pencils, etc.! Here are two lines of defense. For family members who tend to give lots of gifts, have a heart to heart chat. Let your family members know that your children have plenty of things and that they really don’t need any more stuff. If the family member feels it’s important to give gifts, ask for clutter-free experience gifts, like tickets to the zoo, movies, or a local theme park. Second, for the inevitable items that do make their way into your home, establish a storage spot in your child’s bedroom. Kailea had a penny-candy jar in her bedroom for years which she used to contain all sorts of tiny treasures. Clutter hotspot #5: Kids and their jackets, backpacks and shoes. The best storage solution for these items is one that is right by the door your children use most often. Install child-height hooks for jackets and backpacks. For shoes, consider a decorative basket or bin on a shelf. Keep ease of access in mind, as the easier it is to use, the more likely things will get put where they belong and not end up clutter! 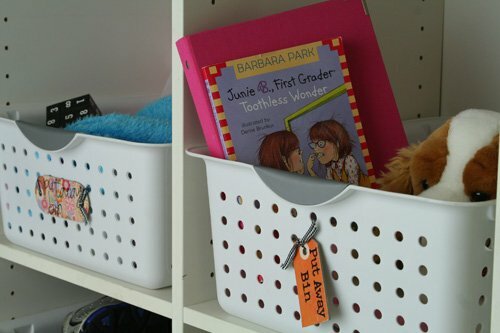 Alright…tomorrow I’ll be sharing more organization ideas for kids’ stuff. Up next: kids’ clothes and toys! What are your biggest clutter challenges? Have we touched on your top cause of clutter yet? Thanks for sharing your thoughts in the comments! Great tips. I can vouch for the daily routine in particular. When my family instituted Family Cleanup every night, it made a huge difference to the level of clutter in our house. Everyone pitched in so it wasn’t that much work (less than 15 minutes) and it soon became a habit. That’s fabulous Nancy. And it makes such a difference…makes the home a much happier place to be. Yes! The debris these little people leave in their wake can be so overwhelming! I tend to pile it on separate steps on the stairs. They are supposed to take it up every time they go up, but that only seems to happen with 1/4. For the others, once a day I make an announcement that if things aren’t cleared and put away in five minutes, they are going out the door. It works for us! I bet that does work, Tiffany! Thanks for sharing the idea. The one thing I always did was take half her toys, bag them up and put them in a storage closet. The ones that she liked to play with I put in a little wagon and she pulled it around the house to where ever she was playing. When she was too young to pick them up herself I would have her hand them to me while I put them in the wagon. She was getting the idea from the beginning!! Great tips JoAnne! Love the idea of a little wagon to store and organize toys. So cute!